To talk about this episode at all means spoiling events in Captain America: The Winter Soldier as this episode comes right on the heels of that. Coulson believes May has been working for the Clairvoyant and the plane has been overridden and is going to an unknown location. May says she was reporting to Fury, and asks why Fitz was messing with the phone lines. Fitz says he was trying to talk to Simmons at the Hub, because she's secretly analysing Skye's blood to find out about the healing drug, which Coulson and Skye wouldn't let them investigate. The plane is full of secrets. Coulson knocks May out and puts her in the interrogation room with Ward. Garrett's plane is chased by Shield drones and comes to the Bus, so Coulson shoots down the drones and Garrett comes onboard. Garrett says it looks like they're flying to the Hub and Coulson believes Agent Hand is the Clairvoyant. Skye finds an encrypted message revealing that Hydra are back and have been hidden within Shield. At the Hub Trip realises Simmons is hiding something so she admits that she's testing Skye's blood, he helps her contact Agent Weaver at the Academy, but Weaver says they're under attack from Hydra. Victoria Hand tells a group of agents to attack Coulson's plane and take out his team. The agents find Trip and Simmons and demand they swear allegiance to Hydra or die, Trip takes one of Hand's agents hostage, thus passing the test. Hand's group have been killing anyone who isn't loyal to Shield and she believes Coulson is Hydra because of all the iffy stuff his team have been doing. When the plane lands Shield attack it. Coulson gets May to call Fury, but the voice on the other end of his private line says he's dead. Coulson is furious at her, but needs her for now. The team sneak out and go into the Hub to rescue Simmons and Trip. Ward and Skye go to the nerve centre, and Ward asks Skye out. Garrett mentions details about Coulson's interrogation that no one else knows, meaning Garrett is the Clairvoyant. Garrett gathers Hydra agents, but Hand's team heard everything and capture Garrett. 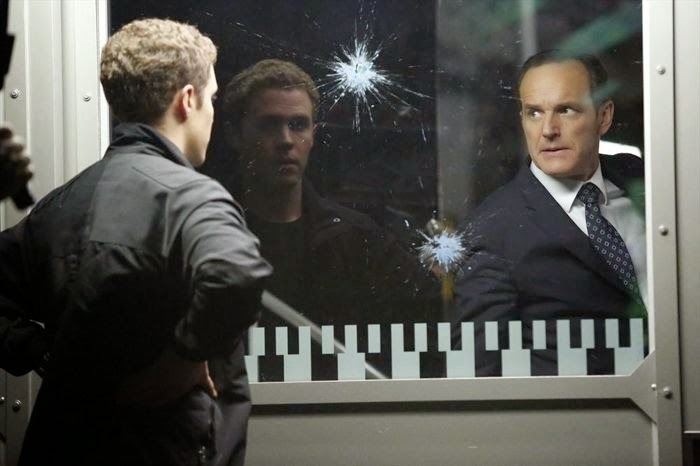 Hand takes back control of the Hub and leaves Coulson in charge, they may be the last high-level agents still loyal to Shield. She takes Garrett to the Fridge to be imprisoned and Ward requests to go with her. On the way she suggests Ward might want to kill Garrett, but instead Ward kills her and her men. Garret congratulates him, revealing that Ward has been working for him all along. At some point we were either told, or it was telegraphed, that most people on the show were secretly Hydra, it made for intense if tiring viewing. May's betrayal hits Coulson hard and he's furious with her. When she reveals that she had direct access to Fury and knew about project TAHITI he's even angrier because those questions haunted him, but she says she was under orders to monitor him and make sure he was OK. It's probably the best form a betrayal could take, but it's still a betrayal. Coulson's face changes the moment Garrett mentions that Raina had been in the machine. On my first watch I recall thinking something was up moments before that, because Garrett's rant was a bit odd, even for what we've seen of Garrett so far. Hand believes Coulson is Hydra for some pretty good reasons, a lot of what Coulson and the team have done is outside protocol. Recruiting Skye, covering for Amador, refusing to follow orders; Shield had noticed these things without knowing the motives we've seen. Blake had expressed concerns and then got hospitalised on Coulson's op, which looks awful. Coulson and Hand discuss the fact that they could be the last of Shield and it seems like a period of cooperation is coming. That would've been cool, Victoria Hand wasn't likeable but she was an effective character. Her hardline approach at rooting out traitors and Hydra agents seems like it would've created interesting conflicts with Coulson. May's reveal about Fury is borne of desperation, the discovery of her secret is badly timed what with the Clairvoyant and Hydra stuff. The level of deception that Coulson was subject to, from the people and organisation that he trusted. May researched what was needed and told Fury before the Director gave Coulson team parameters, meaning Coulson was being manipulated before the team was assembled. Everyone there (besides Skye) was chosen to further May's orders to monitor Coulson and keep him well. FitzSimmons have the skill to rebuild him, and Ward had the skill to take him out if needed. This explains her distrust of Skye, the one wildcard on the team who hadn't been vetted. Coulson patches May up (as he's done before) but makes clear they are no longer friends, though he believes she's an ally and needs her help in the Hub. Ward tells Skye he has feelings for her and asks her out, just as he's about do take out a hallway of Hydra agents. He seems very vulnerable in those moments, but he's still playing the part he's been playing the whole time. Skye is wary but as he's likely to die she kisses him, I did roll my eyes at this on first viewing, but I liked Skye less that time around, and I've never liked Ward. Of course it turns out he was a kind of boring character on purpose. When Garrett is taken into custody Ward reacts badly, apparently betrayed by his mentor, and asks to be the one who turns the key on Garrett's cell. It's very convincing, and we honestly think Ward wants to kill Garrett right up until the moment that he kills Agent Hand. In that moment the trajectory of what's coming next (which is already dramatically different from anything we might have guessed pre Cap 2) changes. It seemed like Shield was about to pull through, but the war has only just started. Trip realises Simmons is hiding something, and he confronts her about it (he's professional). There are moments when we're supposed to think Trip is Hydra. He accepts her actions are well-intentioned and even helps her to contact Weaver. He comments that she isn't very good at lying, she agrees but says she's gotten much better. Perhaps in that moment we're meant to suspect Simmons just a bit. Even though they're both in the Hub they only find out about Hydra when they contact a panicked Weaver who is glad to see them alive and warns them to hide. Trip does what Weaver said, and again there are unnerving moments when we aren't sure of his loyalty. When Hand and her agents apprehend them Trip proves his dedication to SHIELD against HYDRA. This is an episode where no one (audience or characters) is sure who to trust. Simmons defends Coulson to Hand, which is when Hand lists her understandable reasons for suspicion. Fitz handles himself pretty well despite the murky situation and danger. At the start he yells at May for shooting at him and when she turns things back on him he is honest about why he was covertly contacting Simmons and is accusing towards Skye and Coulson who he knows have been hiding something together. These disagreements are put aside with the reveal of Hydra's rise and the challenge of getting out of the plane unharmed. Fitz is adamant about saving Simmons, though no one disagrees. Garrett makes it clear that Hydra plans to make use of Fitz's skills, with or without his agreement, and though he's upset Fitz remains defiant, though this only makes Garrett chuckle. In the fight with Garrett and the Hydra agents Fitz ducks out of the way, but he does toss weapons to Coulson and ends up shooting someone to save May, probably his first kill. Skye finds and decodes the Hydra message, which is hidden in Shield comms. She and Ward split from the main group to try and take the nerve centre of the Hub. While hiding in a cupboard Ward tells her about his feelings for her, and she responds to his sudden vulnerability as Ward is self-deprecating. Though she makes clear she would want to take things slow, she knows about his thing with May and is wary of what he's looking for. She kisses him because he's going into danger. At the end she's shocked about the Garrett reveal and realises how hard it's hitting Ward and Coulson. 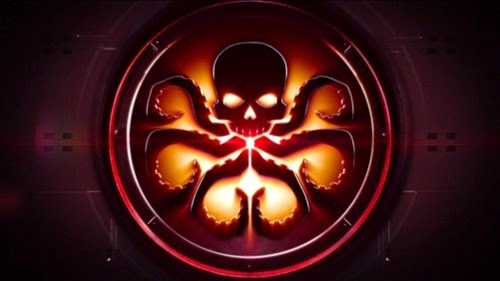 That something like Hydra, an enemy thought to be decades dead, was hiding in Shield all along. That Garrett (and probably others like him) have been using their positions to further their own ends in secret. Though given the size and scale of Shield (which we've only glimpsed in the show), maybe it isn't that weird. Hydra in general and I think the 'of the week' format has been fairly broken by this. Garrett specifically, it turns out he's been masterminding most of their opposition all along. Garrett didn't intend to kill them, he was furthering his own motives and fine with the secrecy, but he realises Fury must have rumbled them and so Hydra had to "come out of the shadows". "Phil, this is me being honest." "No John, this is you being a psychopath." As this ep is the big spoiler turning point there's not much to say down here now. This ep and the ones that follow are the reason I put the Spoiler section in. There will be stuff in later episodes that relates to series 2, but Turn Turn Turn is all about this change.